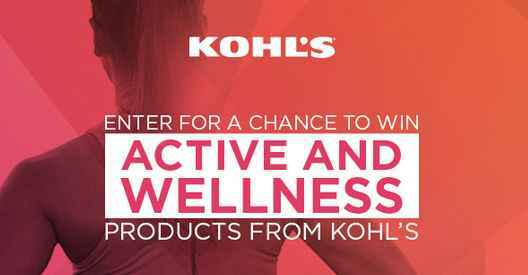 Kohl’s Department Stores brings you the KOHL’S Active and Wellness Event Sweepstakes where they will be giving away Fitbit Flex Activity Tracker, bliss Sweeping Beauty Sonic Facial Cleansing Device, $100 Kohl’s Gift Card, Columbia Sheet Set and much more every month. How To Enter: Go to this link:kohlsactiveandwellnesssweepstakes.com during the sweepstakes period and follow the online instructions to register by entering all information requested on the registration form and once you filled out the entry form now Click on the submit button to complete the registration form. When To Enter: The KOHL’S Active and Wellness Event Sweepstakes begins on or about 12:00:01 am Central Time (“CT”) on Monday, January 1, 2018 and ends at 11:59:59 pm CT on Saturday, December 3, 2018. Who’s Sponsor: The Kohl’s Department Stores, Inc., N56 W17000 Ridgewood Drive, Menomonee Falls, WI 53051. Sweepstakes Prize: Fitbit Flex Activity Tracker, bliss Sweeping Beauty Sonic Facial Cleansing Device, $100 Kohl’s Gift Card, Columbia Sheet Set, JBL Wireless Over-Ear Headphones, Women’s Gaiam Om Yoga Leggings, Nike Brasilia 7 Medium Duffel and more.